One of the best things about starting my online store, Quatrefoil Design, has been working with new and wonderful Southeast artists, and sharing their work with my blog readers. I am very excited to announce a new artist in the Quatrefoil Design store, Kendall Boggs. Kendall’s story is so inspirational. She is a wife and mother, married for over 30 years, with three grown children and two grandchildren. She has always had a creative approach to life, and after being an interior designer for 15 years, she decided to try her hand at painting. It was a ‘now or never’ time, and she put her heart and soul into working on her paintings and developing her style. In the short time that she has been marketing her work, she has sold hundreds of paintings and I see great things for her! Here is a selection of the Kendall Boggs ‘dress series’ and landscape paintings that are available in the Quatrefoil Design store. Click here to see more, or go to this link: http://www.quatrefoildesign.bigcartel.com/artist/kendall-boggs. Don’t see a color or size you like? 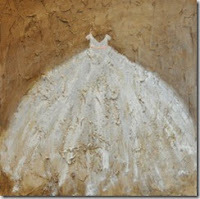 Kendall will create a custom dress painting for you, based on your color and style requirements. Click here for more information, or use this link: http://quatrefoildesign.bigcartel.com/product/original-art-by-kendall-boggs-customize-your-own-dress-painting. Kendall also has a wonderful blog, http://kendallboggsfineart.blogspot.com/. I am so thrilled to represent a selection of her work in my store – please stop by Quatrefoil Design (http://www.quatrefoildesign.bigcartel.com/category/art) frequently to see new work. Nice pieces! It's so nice to learn of new artists. It's wonderful to see so many women of my age breaking out and doing something different than they've done before. I have known Kendall for a long time, and I am so excited to see you featuring her work! She is a wonderful Southern artist with a distinctive technique and "voice." Kudos to you and to her! my pick would be the trees. but the dress is very different. Kendall is an amazing woman and artist. I fell in love with her art from the moment that I saw it. It speaks to my soul. It's pure and easy. Truly beautiful! Have a wonderful week, sweetie. Design Chic was the lucky winner of her dress series giveaway and her work is STUNNING...even more beautiful in person!!! Not only is her artwork amazing, but she is such a warm and lovely person. Love Kendall and her work! Just another reason why it is so much fun to be in the art world, getting to know people like her! These are beautiful...if I had a little girl I would love to put a small grouping of these on a wall, they are just dreamy. I love her interpretation of dreamy dressing! And I am always really inspired when I hear of someone who just decides to "go for it"....great story and beautiful art!